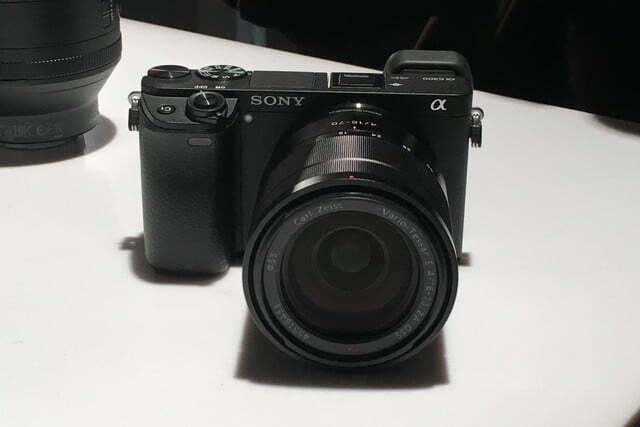 Sony has announced a follow-up to one of our favorite mirrorless cameras, the A6000. The long-awaited A6300 claims the world’s fastest autofocus speed and the highest number of autofocus points, and its ability to capture 4K video (with mic input) makes it a capable camera for video, as well as photos. Perhaps most exciting is the camera’s on-sensor phase-detect autofocus system (4D Focus). Sony claims that it can lock focus as quickly as 0.05 seconds; the A6000, which previously had the “world’s fastest” claim, clocked in at 0.06 seconds. Speed is one thing, but the A6300’s AF is also more accurate, thanks to the 425 AF points that cover the entire frame; Sony says it’s currently the most you’ll find in an ILC. The autofocus system also has new high-density tracking tech that better detects and tracks a subject, by activating more AF points around it. Sony says it’s particulary useful when shooting continuously at 11 frames per second or a new 8 fps live view mode. In our brief hands-on time with the A6300, the AF system was very fast, although at those speeds, it’s really hard to measure with the naked eye (can you tell the improvements from 0.06 to 0.05 seconds?). The tracking system also works well, although it seems to have trouble recognizing which subject to follow when there are two moving things in the frame. Sony says the cameras are early samples, so we won’t say much about the camera (or the photos, which we weren’t allowed to take with us) until we get a production unit in our hands. We thought the A6000’s video capabilities (Full HD at 60p) were pretty good, but it wasn’t a video camera. The A6300 changes that: It’s the first Sony non-full-frame ILC with Super 35mm internal 4K movie capture (no external recorder required). With the aforementioned full-pixel readout without pixel binning, it collects 20 megapixels more information, approximately 2.4x (or 6K equivalent) as many pixels as 4K UHD, Sony says; it’s then oversampled “to produce high-quality footage with exceptional detail and depth.” Like all other Sony 4K cameras, the A6300 uses the XAVC S codec for high-bit-rate (100Mbps in 4K, 50Mbps in Full HD) recording. The new AF system also focuses two-times faster than the A6000, with adjustable AF speed and tracking sensitivity. Manowitz says it’s the best 4K video quality from a Sony consumer camera, to date. The A6300 can also handle Full HD at 120 fps at 100 Mbps, which Sony says it’s another first for APS-C ILCs. There is support for S-Log gamma and S-Gamut for video editors; zebra for exposure control; and the mic input also supports XLR mics. All these features make the A6300 a suitable budget video camera for YouTube creators and indie filmmakers. The dust- and moisture-resistant camera is made out of magnesium alloy, which gives it a good balance of sturdiness and weight. Nine customizable buttons let you assign your favorite functions to them. The XGA OLED Tru-Finder electronic viewfinder’s resolution has been upgraded, to 2.4 million dots. A new mode lets you view images at 120 fps, which allows you to better track a subject. Manowitz says it has the immediacy of an optical viewfinder, but with the fast tracking advantage of an electronic variant. 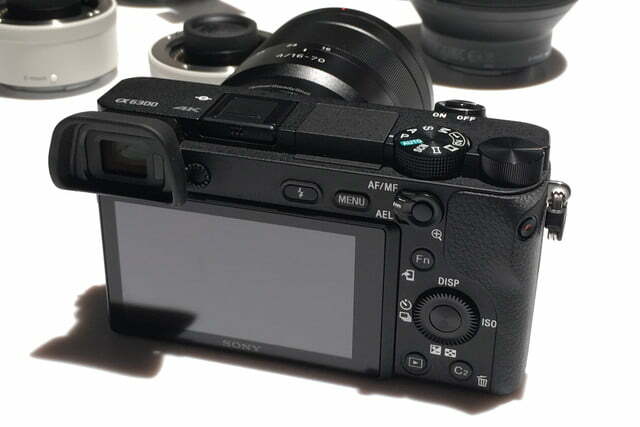 Of course, the A6300 has Wi-Fi and NFC built in. Nothing new here, but it supports QR code pairing for non-NFC devices, similar to how Olympus cameras pair with phones and tablets. The A6300 will go on sale in March, for $1,000. 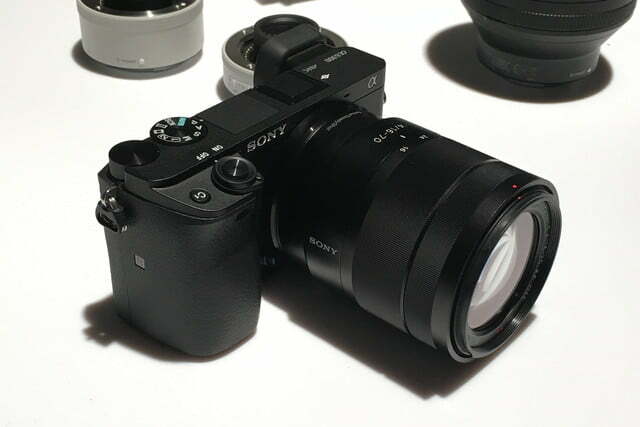 It’s much higher than the A6000’s launch price, but for what you’re getting, Sony could justify the increased pricing. To get some of these features and functions, you would have to spend much more for a Sony A7-series camera. 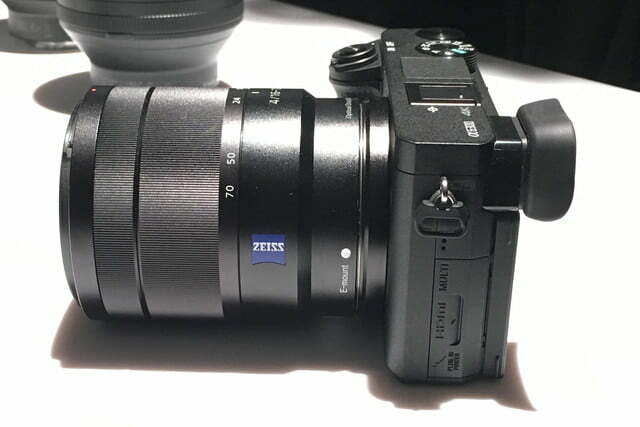 The camera will also be available in a $1,150 kit, which comes with a 16-50mm lens.